Canadian father and son actors Donald and Kiefer Sutherland have not really worked together in a film before, although each has done westerns (Kiefer in the Young Guns movies, and Donald in a remake of Dawn Rider). This is a traditional sort of western, presenting again the question of whether a gunman can reform, when despite his good intentions circumstances call him back to his former ways and skills (like many westerns from Hell’s Hinges to The Gunfighter to Unforgiven). The movie begins with a flashback, although we don’t know that’s what it is yet, of a boy apparently dying of a gunshot. Then come introductory shots reminiscent of films by directors Budd Boetticher, Sergio Leone and any number of other westerns, of a lone rider making his way across the landscape and the credits. 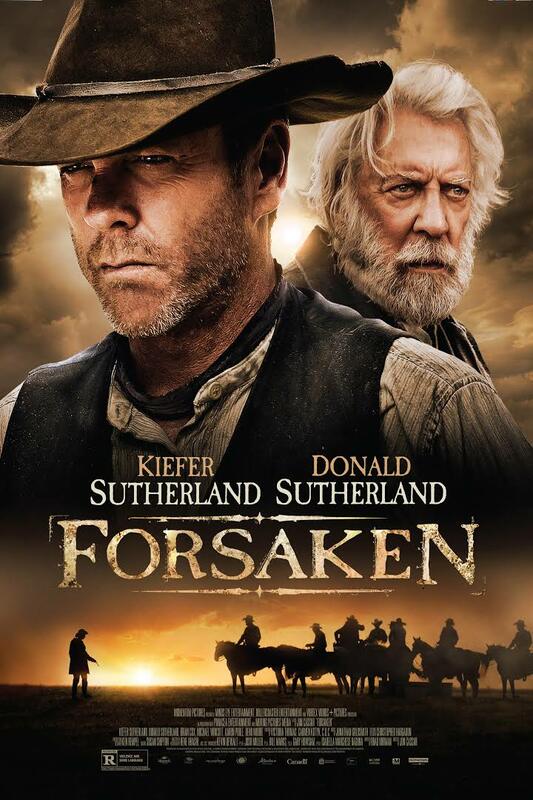 It is 1872 in Wyoming Territory, and this is John Henry Clayton (Kiefer Sutherland) heading homeward to Fowler, where he has not been since he left to fight for the Union in the Civil War ten years earlier. John Henry (Kiefer Sutherland) has returned, but he and his father (Donald Sutherland) have a difficult past and are still wary of each other. His father is the Rev. William Clayton (Donald Sutherland), a white-haired, unyielding man from whom his son has long been estranged. John Henry discovers that his mother is recently dead, and there seems to be little common ground with his father. In town, we find that John Henry is a well-known gunman, although he says he no longer wears a gun. He meets Gentleman Dave Turner (Michael Wincott), a southern-born gunman whom he treats with a modicum of respect, and Frank Tillman (Aaron Poole), whom he doesn’t. They are both employed by James McCurdy (Brian Cox), who is trying to buy up all the surrounding land cheaply in anticipation of the coming of the railroad. 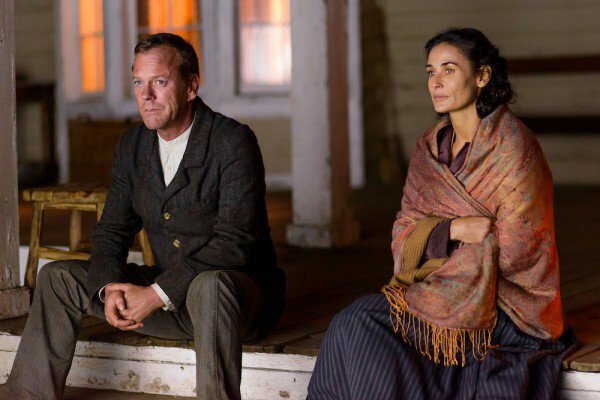 John Henry (Kiefer Sutherland) and Mary-Alice (Demi Moore) try to sort out life’s turns. John Henry also encounters a former flame, Mary-Alice Watson (Demi Moore), who married someone else eight years ago. Although there is clearly still some affinity between them, John Henry tells her she was right to have married Tom Watson. Watson (Greg Ellis) is not so sure of his wife’s affections. As McCurdy’s men increase the pressure and the violence, Tillman sees that John Henry is serious about not taking up the gun again, and they beat him mercilessly. Mary-Alice helps the Rev. 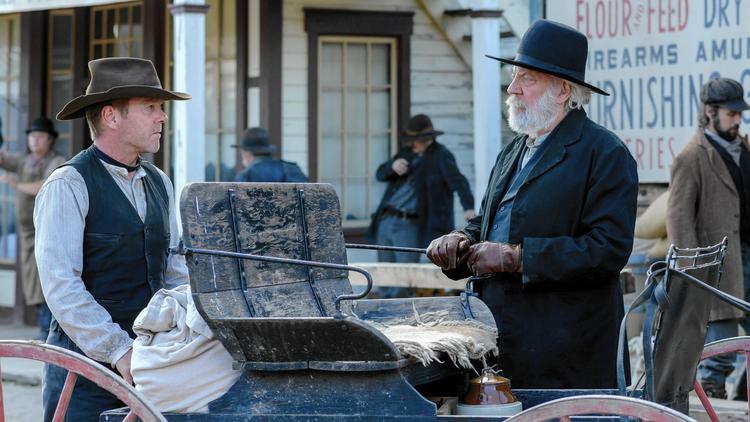 Clayton drag John Henry to his buggy, to her husband’s distress, and he decides to sell out. John Henry revisits his family’s past. He starts clearing a field that he says his mother had wanted him and his father to clear together, although the father denies it. Finally, he seeks some solace at church, where he and his father talk about the death of his brother William in a drowning accident when they were boys (echoes of one of Donald Sutherland’s best movies, Ordinary People). And he confesses that he quit the gunman’s life when, defending himself against two attackers, he accidentally killed a boy in the scene we saw at the movie’s start. We see Rev. Clayton start to work on clearing the field, indicating changes in his relationship with his son. Father and son (Donald Sutherland and Kiefer Sutherland) work on their relationship, which is not as dreary as that sounds. [Spoilers follow.] As McCurdy’s violence mounts, John Henry maintains his resolve not to resort to his old skills. But when Tillman and his boys knife the Rev. Clayton in town, and it looks like Mary-Alice’s husband is next, John Henry is pushed over the edge. He gets out his gun again, and at the general store picks up a big LeMat revolver, which holds nine bullets and a 10-gauge shotgun shell. There follows a classic extended saloon shootout, very well done. But when John Henry emerges into the street, there is Gentleman Dave. Pleading that he has left his Colt in the saloon and the heavy LeMat would put him at a disadvantage, he goes back into the saloon. But instead of returning immediately to the street, he finds and initiates a showdown with McCurdy. At the end, Gentleman Dave concedes that he no longer has an employer, and the two of them go their separate ways. Narration by Gentleman Dave closes out the movie with what little is known of the rest of John Henry’s doings. 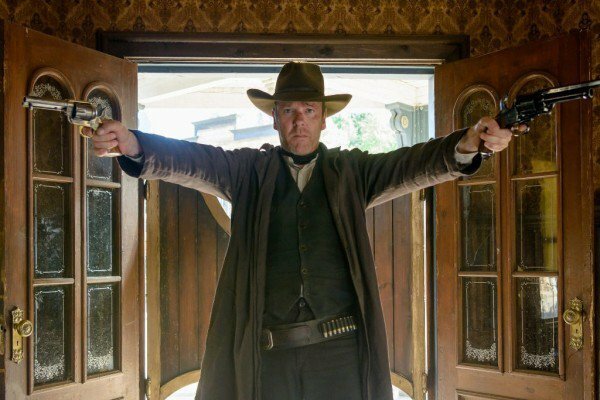 John Henry (Kiefer Sutherland) makes an entrance in McCurdy’s saloon. Note the big LeMat in his left hand. There is not much about this film we haven’t seen before, but it’s done well here. The Sutherlands are good actors, and are convincing as father and son in a strained relationship. The development of that relationship works. John Henry Clayton is not so different from Jack Bauer (the relentless and deadly character he played in several seasons of television’s 24), it turns out. He’s persuasive as the haunted gunfighter trying to quit, and he’s very good as the experienced killer who knows his business. Demi Moore, who is not seen much on film these days, is also good as Mary-Alice. She seems well cast. One of the juicier roles, that of Gentleman Dave, is very well done by Michael Wincott, albeit in a strange hat. He plays Gentlemen Dave with a courtly silkiness and quasi-ethical consideration that adds interest. That is not to say that the film is without missteps. When Tom Watson confronts John Henry and demands whether he still loves Mary-Alice, he remains silent, feeding Tom’s fears. The appropriate answer is “She’s married to you, and I respect that,” which he has already told her. John Henry’s use of language changes. At first, he speaks in a relatively uneducated manner, while his preacher-father speaks more formally. But when he’s talking with Gentleman Dave at the end, he adopts Dave’s courtly form of speech with polysyllabic words. That’s probably intentional by the writer, Brad Mirman. Although not quite a classic, if you’re looking for a good traditional western, this is worth seeking out. The end is curiously satisfying, seemingly formulaic but also true to the characters as they have developed. 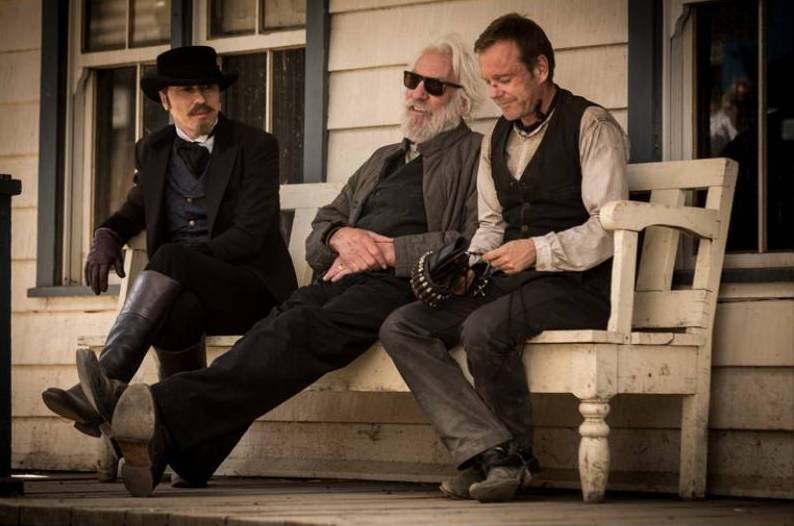 Michael Wincott (dressed as Gentleman Dave), Donald Sutherland and Kiefer Sutherland on the set. Apparently the original cut of the film was three hours and fifteen minutes long. Deciding to trim it to focus on the father-son relationship, the producers have a final film less than half that, at 90 minutes. They were probably right to do that, although one would like to see the longer cut, too. Among the material on the cutting room floor are an introductory scene showing how John Henry was in a gunfight that led to his life as a gunman, and a subplot involving a young man drifting into the gunslinger’s life and leaving his girlfriend, while John Henry moves in the opposite direction. Kiefer Sutherland was the moving force behind the film and putting it together. He and director Jon Cassar had worked together on 24 (Cassar directed 58 episodes), along with co-stars Michael Wincott and Greg Ellis. Made for a budget of less than $20 million, this is one of those productions involving a lot of Canadian talent, locations and funding, like The Grey Fox and Gunless. 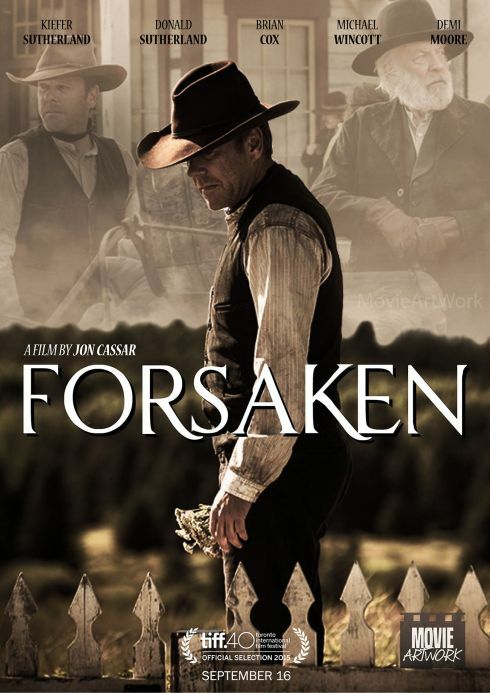 It’s not clear what the title “Forsaken” refers to, unless it’s John Henry’s attempt to forsake his gunman’s life or his feeling that God has forsaken him. This was filmed in Alberta near Calgary, and the cinematography by Rene Ohashi makes good use of the scenery. The elegiac music is by Jonathan Goldsmith. Rated R for violence and McCurdy’s bad language. This entry was posted in Westerns Worth Watching and tagged The Reformed Gunman, The Search for Family on March 5, 2016 by Nicholas Chennault.